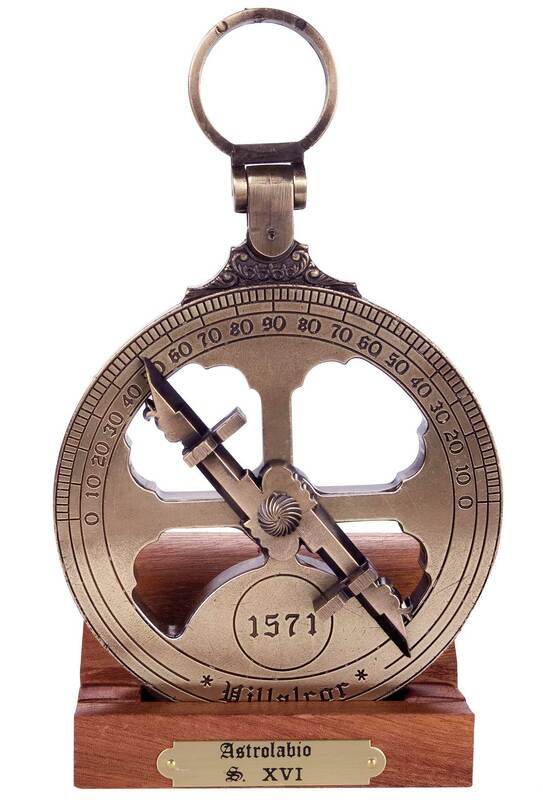 Reproduction of a Mariner's astrolabe realized in 1571 for the maritime forces of Philippe II of Spain (1527-1598). An original specimen of this astrolabe is carefully guarded in the National Maritime Museum in Greenwich (UK). The Mariner's Astrolabe was used to determine the latitude of a ship at sea by measuring the noon altitude of the Sun or the meridian altitude of a star of known declination. It was not possible to determine longitude at sea in the early days of transoceanic navigation, but it was quite easy to determine latitude. To go to a place of known latitude, the ship was sailed to that latitude and then sailed east or west along the latitude line until the place was reached. The Mariner's Astrolabe was a simple brass ring, graduated in degrees with a rotating alidade for sighting the Sun or a star. The ring was cast brass, quite heavy and cut away to keep it from blowing around in the wind. It was a typical navigation instrument used by Christophe Colomb and Vasco de Gamma. Extract from D. Garc�a de Palacio, Nautical Instructions for Sailing, Mexico 1587. He who would take a measurement of the sun with an astrolabe in the sea, must sit near the main mast, which is where the ship rocks the least and is the most still, and placing the second finger of the right hand in its ring, will put his face and the astrolabe directly facing the sun and will know that he is by the shadow of the sun, and will raise or lower the indicator (alidade) until the sun shines through the two perforations in the retes and when that is done, will observe on the astrolabe the degrees indicated by the point of the alidade and with them will make the calculations according to the norms. Attention to detail, historical interest, beauty of forms characterize this very fine Mariner's Astrolabe, shipped complete with a hardwood display stand and a user guide ( ).